The 2013 U.S. News & World Report Best Undergraduate Engineering Programs Ranking lists the Clark School's program as 23rd in the nation, up one position from last year. The Clark School is ranked 11th among public universities. The Department of Aerospace Engineering is 9th in the country. 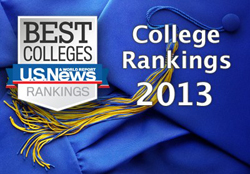 For more details about the rankings, visit the U.S. News & World Report web site.